Italian Communist Party (PCI) leader Palmiro Togliatti famously described his party’s combination of Bolshevik tradition and Italian patriotism as like the body of a giraffe: oddly shaped yet functional to a certain purpose. After the demise of the Soviet bloc in 1991, the unusual creature of the PCI went on to give birth to a series of center-left projects ultimately culminating in today’s Democratic Party (PD). Yet the purpose of the PD, which itself represents a combination of post-Communist identity and pro-European liberalism, is today far from clear. Interior Minister Matteo Salvini, whose hard-right Lega now governs Italy in coalition with the anti-establishment Five Star Movement (M5S), likes to claim that “the Left” has been in power for two decades. In fact, the PD and its predecessors were in office for just half that time, often allied to center-right forces. But the self-described “center-left” PD certainly did become an establishment force. Founded in 2007 at the end of a series of mergers, the PD combined the old PCI’s embrace of republican institutions with an orientation to Italian business elites and the European project. Lost in this process was the Left’s traditional base, which was already victim to a decade of crisis and a quarter-century of stagnation. Both March’s general election (in which the PD slumped to 19 percent) and subsequent local contests have illustrated the demise of the old red fortresses. The regioni rosse of central-northern Italy are turning to the Lega, whereas in the poorer south, the M5S today wins almost half of the vote. A PD that hopes to lead the “anti-populist resistance” against the Lega-M5S government is now only fourth-most-popular among blue-collar workers. The PD retains a powerful institutional profile, based on its residual regional and municipal strongholds. Yet its social base is clearly thinning. While survey data indicates the oldest and wealthiest Italians are most likely to vote for the PD, M5S’s success in doubling its vote among over-sixty-fives in March’s elections tells us that even elderly voters are ever-less bound by old party allegiances. The tensions between M5S and Lega mean that their hold on their new base is hardly stable. But faced with its own identity crisis, it is far from clear that the PD is the force best able to lead the resistance against them. The PD is still a mass membership party (with 450,000 members — down from 830,000 in 2009) but it is not simply the child of the old PCI. Its creation process also involved liberals and Christian Democrats, and in 2017 parts of its ex-Communist wing, known as “the firm,” split away. Its relations with the CGIL, Italy’s largest trade union, is strained; though the union’s force is declining now that some 53 percent of its members are pensioners. Nonetheless, there are occasional signs of continuity. The best example is the party’s Feste de l’Unità: informal summits named after the now-defunct PCI newspaper founded by Antonio Gramsci in 1924. Recent weeks saw PD officials and activists assemble in Ravenna for the national Festa. As the upstart M5S and the radically revamped Lega have surged to the center of national politics, the PD combines its seeming political breadth with a shrinking social profile. After the demise of the old mass parties in the 1990s and the decline of the labor movement, the red-shirted volunteers working at the Festa are part of a party like no other. Since Silvio Berlusconi’s creation of Forza Italia in the 1990s, Italian politics are less a matter of branch-offices and local meetings than TV advertising campaigns and, increasingly, social-media savvy. Unlike its competitors, the PD continues to call itself a party, but has also drifted away from previous, denser models of party organisation. We see this in its use of primaries open even to non-members (an innovation in the Italian context) and 2013-18 secretary Matteo Renzi’s highly personalized leadership style. Despite these changes, the Festa de l’Unità bequeathed from the old Communist Party has elements that would be unimaginable at an event staged by a more straightforwardly centrist force. At this year’s national Festa the interim PD leader Maurizio Martina, close to the Catholic soft left, hosted a talk by Uruguay’s former president (and ex-guerilla) Pepe Mujica. The party even honored the anniversary of Italy’s anti-Nazi Resistance with a gig by the Modena City Ramblers (think long-haired guys shouting into microphones about fascists and strikes). This was hardly a sign of a sharp left turn. Other speakers included “Mr Scissors” (the former IMF director Carlo Cottarelli, known as an architect of budget cuts and briefly mooted as an interim prime minister this spring), and the main debates stage was named after Aldo Moro, the Christian-Democratic statesman murdered by the far-left Red Brigades in 1978. Yet while the PD strives to transcend the postwar opposition between Communists and Christian Democrats, it remains strangely trapped in this past. Indeed, as the upstart M5S and the radically revamped Lega have surged to the center of national politics — together polling 60 percent — the PD combines its seeming political breadth with a shrinking social profile. While the last three decades have fragmented the working-class and popular layers on which the Left was once based, the PD’s final divorce from these categories has accelerated dramatically in recent years. Since the PD’s origins in the 1990s, in the absence of either a traditional conservative or Christian Democratic Party, it has constantly sought to win the neoliberal center ground. In 2014, after legal troubles felled both Berlusconi and longtime Lega leader Umberto Bossi, former Christian Democrat Matteo Renzi guided the PD to 40 percent at the European elections. In next May’s vote, the PD will be lucky to score half that. 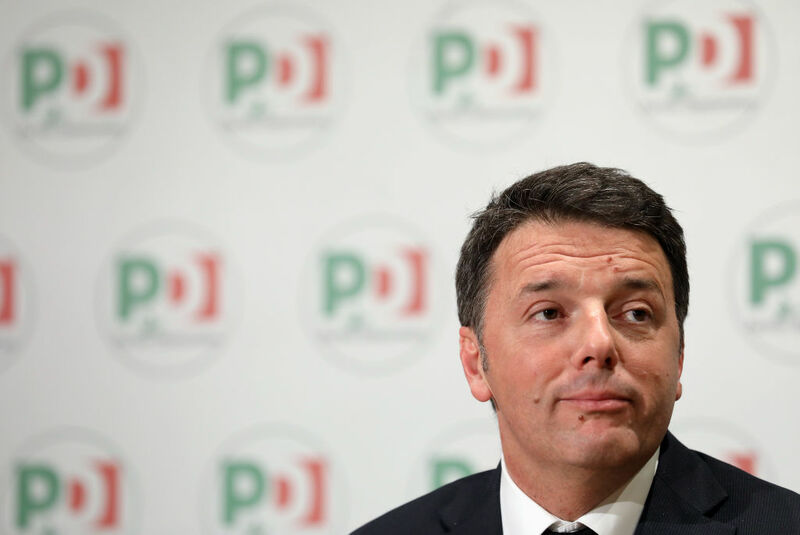 Renzi allies blame the PD’s internal left wing, claiming that it stopped the centrist revolution going far enough. They seek to break with center-left identity and move to a liberal counter-populism modelled on French president Emmanuel Macron’s En Marche! They are buttressed by Carlo Calenda, economic development minister in the last, PD-led government, who joined the party immediately after its election defeat this March. Calenda argues for the creation of a new pro-business, pro-European republican front, which could also sweep up elements of Berlusconi’s now-marginalized Forza Italia. This extends Renzi’s previous efforts to turn the PD into a “party of the nation” transcending political divides, into a bid to form a broad “anti-populist” resistance. But it appears that Orfini’s calls to dissolve the party are also meant to delay the next PD congress. That would prevent a new leadership taking over before May 2019’s European elections. But even if this delay is introduced (other party leaders like Maurizio Martina are instead calling for a primary in January) Renzi might not be able to recover his status as a centrist icon. His star has waned thanks to recent electoral setbacks, from his failed constitutional referendum in December 2016 to this March’s disastrous general election. Calenda has himself cast doubt on Renzi’s return. Orlando’s rhetoric is targeted at winning back votes from the M5S-Lega duo, who claim to best protect Italians from the winds of the global economy. Yet the PD seems unlikely to follow the path of Bernie Sanders or Jeremy Corbyn in steering their respective parties toward an overt socialist politics. Orlando, far less radical than either figure, was trounced by more than three-to-one by Renzi in last year’s leadership contest. And while the Anglophone countries’ electoral systems have helped channel discontent within old party structures, in Italy new parties have already emerged to displace the center-left and center-right. Nonetheless, moves are afoot to save the PD from outright dissolution. This is most notable in the rise of Nicola Zingaretti, who has begun an apparent campaign for the party leadership. A former Communist and president of the Lazio region surrounding Rome, his re-election in March was a rare victory for the PD, and he has promised to reorient the party. The fact that La Stampa as well as the business daily Il Sole 24 Ore have presented him as the Corbynite candidate planning to revolutionize the party is, however, more an attempt at a smear rather than anything close to reality. Zingaretti, the only candidate for the PD leadership already on the campaign trail, is no outsider. According to La Repubblica he is scoping out support from 2016-18 prime minister Paolo Gentiloni and former PD mayor of Milan Beppe Sala, as well as the more conservative union federation. He has, however, called for the PD to change its tone, asserting that “If we do not immerse our government action in the people’s suffering and desire for recovery, then people will rightly kick us out.” His longtime association with established PD leaders is offset by recent clashes with the centrist Orfini and his calls to deal with the issues that led to M5S’s rise. PD leaders of all stripes seek to repair a tarnished brand. But mere marketing exercises will do little to connect the ‘resistance’ to the Left’s now-disappeared social base. While the party’s centrists seek a liberal-Europeanist “resistance” to the M5S and Lega, others seek to split the government coalition from within. The M5S, with huge backing among public-sector workers, the young, and the unemployed, has more than any other force benefited from the PD’s troubles. Since this insurgent party’s breakthrough at the 2013 election, elements of the soft left have sought to “bring home” this base, and see M5S’s pact with the viciously anti-immigrant Lega as an opportunity to expose the hollowness of its claim to transcend traditional Left-Right divides. Yet it is hard to escape the sense that Zingaretti sees the PD’s malaise as a marketing problem. In this vein, Zingaretti has been careful to avoid giving the impression that he is returning to the “old left.” This was particularly apparent in his exchanges with Massimo d’Alema, the ex-Communist and 1998-2000 center-left prime minister. While Zingaretti’s own administration in Lazio is reliant on the local M5S, he has made clear that he does not foresee any formal alliance with this movement. Nor does this transactional arrangement offer many clues to how the center-left could begin to win back votes from M5S, which has not lost support to left-wing parties simply because of its coalition with Lega. Zingaretti’s suggestions to expand the PD’s online presence (the M5S itself began as an Internet-based movement) have not been matched by serious policy alternatives. Flattered by Il Fatto Quotidiano newspaper, some in the PD do hope to find allies in M5S. The Festa offered a notably warm welcome to Roberto Fico, M5S president of the lower house, who is seen as a left-winger within that party’s ranks. Fico has distanced himself from the government line on immigration, meeting African farmworkers and tweeting his welcome to refugees. For those in M5S dissatisfied with the pact with the Lega, Fico like the party’s “activist” face Alessandro di Battista (currently in “exile” from Italian politics, touring the Americas), appears as a potential alternative leader. For now, the front man for the government is Giuseppe Conte, a weak prime minister controlled by Salvini and M5S leader Luigi di Maio. At the beginning of September it was revealed that he had applied for a law chair at La Sapienza University, sparking widespread insinuations that he may soon be looking for work. There are, at least, tensions in his government. The “anticorruption” M5S was recently embarrassed by an embezzlement case that resulted in a court order demanding that Lega repay €49 million in public funds. However, it is the Lega, riding high at 32 percent in the polls, that seems more likely to eventually pull the plug. The Lega has not only captured former Berlusconian and far-right support but also begun eating into the M5S vote. With strong advances in once-inhospitable regional elections from Molise to Val d’Aosta, the Lega is also becoming truly national. On September 4 Salvini received a rock-star reception in Viterbo, in the Lazio region until 2014 eschewed by the Lega. Salvini dominates the government and may soon bid to become premier. The M5S faces its own difficulties. The Genoa tragedy in August, and the faltering government response, highlighted the Lega’s determination to block moves to reverse privatizations. The M5S also ran into trouble in Taranto, where Di Maio’s deal to sell the ILVA steel plant to Arcelor-Mittal sparked protests by both residents demanding protection against poisonous waste and trade unions opposed to layoffs. In government the “anti-establishment” movement can no longer be all things to all people. Italians’ grievances do not necessarily fit into Salvini’s agenda; beyond the currently magnified role of migration policy, issues around employment rights, infrastructure and public health remain in the public eye. Yet what these lack is a concrete political expression, or indeed a party prepared to offer any plan to regenerate Italy’s long-faltering economy. The PD in particular shows few signs of life. Its participation in the August 28 protest against the meeting between Salvini and Hungarian premier Viktor Orbán, as well as its own planned rally in Rome on September 30, represent at least some bid to “return to the squares,” the sites of social protest. Yet since the 1990s the PD has become a party of the progressive professional classes, and there are few signs that it is able to reorient to the millions of Italians who struggle to make it to the end of the month. PD leaders of all stripes seek to repair a tarnished brand. But mere marketing exercises will do little to connect the “resistance” to the Left’s now-disappeared social base.